In the analysis of visual content on people’s social media profiles, I found many of my informants (around 70%) have uploaded a great amount of un-edited photos to their online album. Furthermore, many of them told me that not only they themselves, but also many of their close friends and relatives all fancy uploading all the photos from their mobile phones or cameras to their Qzones. Even those who did not upload all the photos to their Qzone told me that it was a commonplace phenomenon among their QQ friends. ‘Un-edited photos’ is a “myth” which I have acknowledged a long time ago, however have never managed to get a satisfying explanation. My curiosity about this myth climbed to the peak when one day I found that my informant Dawei just uploaded 248 photos about his one-day trip to a nearby sightseeing mountain area (1 hour drive from where Dawei lives). Dawei visited this place with his family (wife and son) and a family of his ‘lao xiang’ (literally means, old countryside guy, refers to people from the same original rural area) who came to visit his family during the national Day Festival (7 days holiday in early October). I further clicked into his album, there are 20 web pages of photos, and each web page illustrates 12 photos (see the screenshot above). It seems that from the first moment they met each other to the last moment when they said goodbye, EVERYTHING (not only people but also food, car, trees, bridges, river, stones, etc) was recorded by photos. Plus, there are several photos of everything they encountered. 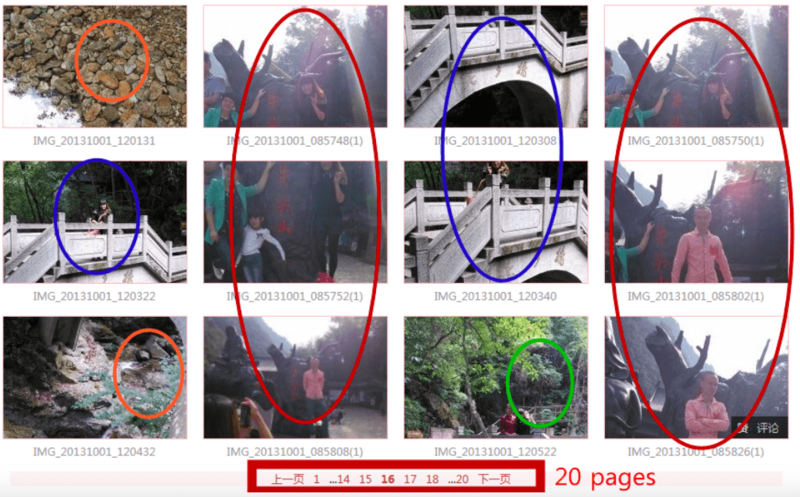 For instance, the 12 photos on page 16 reconstruct the situation at that moment: They came across a stone bridge and people took three photos with similar pose, (blue photos) the orange photos were brook and plant under the bridge, the green one was the view from the bridge. And those six red ones were taken when people came across the bridge and met an artificial tree root with calligraphy on it. As an ethnographer, who probably is supposed to take as many photos as possible and use photos to recapture some specific moments, I find my informants’ obsession of photography and their of visual data collection on the scene put me to utter shame. But why do people do this? They not only took hundreds of photos, but also uploaded ALL OF THEM online. I am more than confused. 1. “Lan” (Laziness) – it is the first reason given by 90% of my informants without thinking. It seems that people regard selecting photos as a big trouble, and no one is bothered to spend some time on it. “Well, I am lazy, you know, uploading all of them is just easy and convenient” as one put it. 2. “No Memory Limit online” – 60% of my informants added this as a second reason. Given most of my informants’ technology resource, this reason is very true and pragmatic. The digital terminals that most rural migrant people can afford are a Smartphone (cheap ones), and a digital camera in some well-off families. However both of these two digital terminals have limited memory space. The only place where people can store a great amount of digital material for free is their Qzone. So, let me put it this way: even though none of my informants has ever heard about ‘cloud storage’, their QQ have actually been used as ‘unlimited cloud disk’ for years even before the idea of ‘cloud storage’ was getting popular worldwide. “Once a few weeks, all the photos on my mobile phone have to be deleted since there is memory limit”, as LXD said, he uploaded all the ‘have-to-go’ mobile photos to his QQ online album. “I will upload all of them to my Qzone, so that people on the photos can go and view their photos” ZGY, also used QQ as a collective album which everybody has access to. 3. “They are all memories” – When have been asked “but I am still confused that why did people still keep those somewhat unnecessary photos?” 30% of my informants came back to the first reason ‘laziness’ and showed no intentions to further discuss this somewhat ‘stupid question’, however the rest gave me some more interesting reasons. “Don’t you think those photos, no matter bad or good, were all memories?” WYL, asked me in reply. And she is the not the only one, more than 50% of people hold the opinion that photo is one of best forms of memories and will be valuable in the future. “You may think they are unnecessary now, but all of them will be valuable after 10 years. So keep them.” CC, an 18-year-old girl, said in a grave and earnest way as if she has already experienced several ten years. “My friend came to visit me all the way from his place of working; it is such a unique ‘yuanfen’ (karma). I would like keep all of them, so that when you look at them many years later, you can still remember the details thanks to the photos which have recorded your trip completely.” Dawei said, he is the one who has uploaded 248 photos about his one-day trip. It seems that photos of each moment are regarded as the result of certain karma, no matter the photo itself is good or not. Once I was viewing one of my informants’ online albums with her and her friends, I found people were still so excited about their trip last year, and thanks to the hundreds of photos, people can even recalled what kind of beer they drank, and how many bottles they drank on that day. A consistent set of hundreds of photo worked like a time machine, creating a special space-time; pulling people back into that flow of time which has been locked in the photos. Also given the fact that for my informants going outside for tourist purposes (even a one-day trip) is such a luxury thing which only happened once or twice a year, people have all the reasons to cherish each photo which they took during the trip. 4. “That’s more confident and sincere” – XM, a 23 year-old factory worker, told me that she thought “people who select photos are not confident enough, because they tried to only illustrate the best part and hide the bad, however people who have no problem of uploading all of their photos are more confident about themselves since they would like to share even not perfect aspects of themselves with others.” XM’s opinion is quiet unique and interesting, even though no other person has expressed the exactly same opinion, many people agreed that they will take those who share ‘ugly’ photos of themselves as more sincere people. “There are so many fake things in Chinese society, I hate hypocritical person, I am not a hypocritical person, so I will let everybody see the real me, at least online.” Apparently, ZF feels very proud of himself being sincere and he actually take the social media as the place to show a real him. 5. ‘Narcissism’ – YZY told me that “I knew I am not good-looking, but I am still a little bit narcissistic”. The reason of ‘narcissism’ is not novel at all since so many scholars have pointed it out that ‘narcissism’ was one of the main reasons of people’s photo uploading. However, my informants are a group of people who can rarely have people’s attention in their everyday life. For most of the time, they have paid attention to their managers, officers, and urban people etc. Thus social media has become somehow the only place where allows them to be narcissistic. Of course there is no fixed answer for the myth of ‘un-editied’ photos. However various reasons given by my informants have definitely showed us how social media album can be used differently among digital-less and low-income population and the meaning of photos can be valued by different group of people differently.